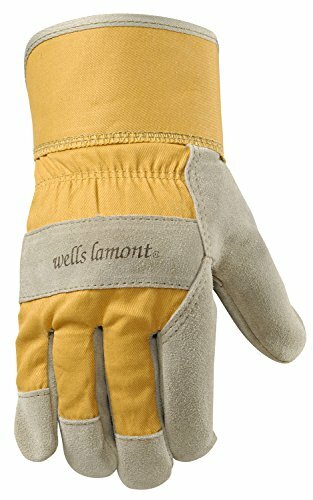 Wells Lamont 4113S Suede Cowhide Leather Palm Work Gloves provide protection and flexibility for your hands while you work. The palm is made of high-quality sand-colored split cowhide leather suede, which gives these gloves superior abrasion resistance and durability. This suede leather can also be found on the first finger, thumb, fingertips, and knuckle strap. The palm patch is reinforced to protect against wear and tear. The double-shirred, elasticized wrist keeps dirt and debris out, and also ensures a secure, comfortable fit. These gloves come with a heavy-duty safety cuff to protect your wrist. Whether you’re gardening, landscaping, or handling tough projects, these Wells Lamont Suede Cowhide Leather Palm Work Gloves will help you get the job done. Wells Lamont - Stubborn about Quality since 1907.